How Can You Protect Your Plants During Winter? Read This! Cold weather can really take a toll on your garden if you don’t take the proper steps to protect your plants. Most plants can survive mild winters with little to no real issues, but some plants are more sensitive than others and even a single bad frost can cause serious damage or even death of plants. That is why it is very important to prepare your plants for winter. Otherwise, you can end up with lots of issues when spring comes around. When plants experience very low temperatures, strong winter winds, and frosts, there can be serious consequences. Some plants, such as annuals, will almost certainly die during this time if proper precautions are not taken. While this is normal, and many people allow that to happen to those particular plants, you can protect your annuals just like your other plants. So, keep that in mind when you are preparing your various plants for the winter in order to decide if you will also take steps to protect the plants that are expected to die out during the winter. Another important thing to keep in mind is that the worst damage from cold weather to plants actually tends to happen in spring when a late frost occurs. The reason that this can cause the most damage to your plants, compared to the coldness and frosts that occur throughout the winter itself is because of the new life budding on plants during this time. When spring rolls around, plants begin to grow much better and more rapidly and many plants have lots of new growth on them. New growth on a plant is not as strong and is more tender than the rest of the plant. Since this new growth is more tender, it is much more likely for it to be damaged under conditions that are not ideal such as cold temperatures. Often times, after spring starts and this new growth begins, a later frost may occur, and temperatures can drop back down to dangerously low for plants. This is the worst-case scenario for your plants and is exactly why it is so important to take the necessary steps to protect them. Your outdoor potted plants are often the plants in the most danger of becoming damaged in cold weather. This is because they only have so much insulation around them, unlike other plants that have virtually infinite insulation in all directions other than above the soil. Fortunately, potted plants are also often the easiest plants to protect from the cold. This is because in many cases, you can simply bring the potted plant indoors during the winter. Of course, if you don’t have room for them inside the house or you simply prefer not to bring them in, you have other options on how to protect them during the winter. If you have a garage or shed that you are able to move them into, that would be much better and provide more protection than just leaving them out. If for whatever reason neither of these options will work for you, you can protect your potted plants in the same ways that you protect your other outdoor plants. Different ways to do this will be discussed below. 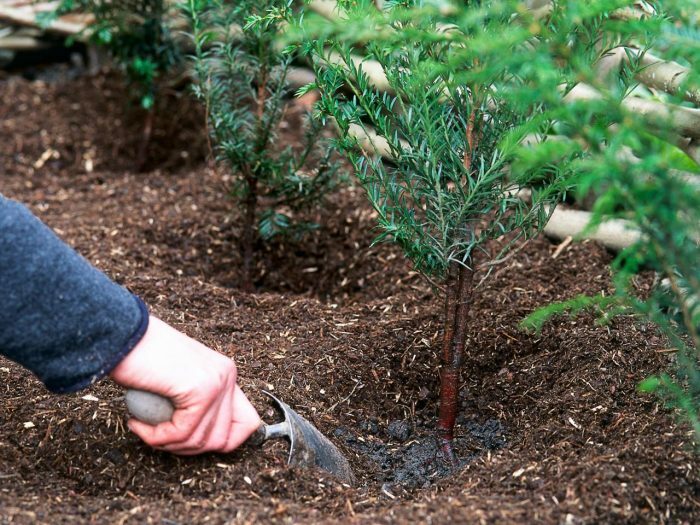 One of the most basic and very effective ways to protect plants during the winter is to use mulch. Often times, your plants already have mulch around the base of them. This is great, but even if the plants do have the mulch already, it is still an important step to refresh the mulch. Ideally, you will want to have the mulch at 2-4 inches deep for optimal protection and benefits. There are several different, important benefits of using mulch around your plants. For one thing, mulch really helps to provide some basic insulation for your plants to help prevent the ground where the roots reside from having direct contact of the coldest temperatures. Another cool benefit is that as mulch decomposes, it helps to enhance the quality of your soil and nurtures the plants. This can be especially helpful during the winter. Then, there is, of course, the added benefit of how nice mulch looks at the base of plants. It is a very pretty addition to your garden. Something that may seem surprising and many people don’t realize is that it is best to actually have a small amount of space around stems where there is no mulch. There doesn’t need to be much room, but just don’t put the mulch where it is touching the stem. This helps to promote good air circulation and prevents rotting. The mulch still helps to insulate the area where the roots of the plant are. 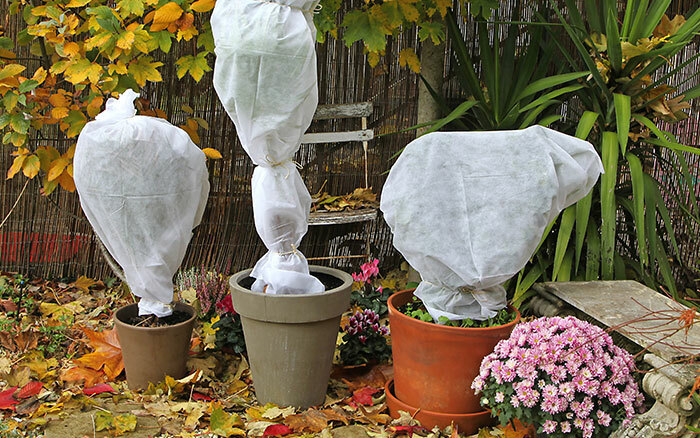 The other most common and very effective method of protecting plants is by covering them. There are various ways to do this and how you decide to do it should depend on several things. Things to consider are the amount of plants you are covering, the size of the plants that you are covering, and the typical intensity of your winters. Some people simply use a blanket to cover their plants. Other options include building a structure with wood posts or thick wire in order to drape a tarp or other fabric over. You can also get special fabric to wrap delicate trees with for added protection. The best way to ensure adequate protection and the survival of your plants through winter is to be prepared and begin early. Preparing your outdoor plants for winter in the fall is your best bet at keeping them safe and preventing damage or death. It is generally a fairly simple and straightforward process to do so. However, don’t stress yourself out over it too much, even if a plant does become slightly damaged, it will often bounce back after a season or two and most plants do survive the winter just fine.